We are very pleased to announce that we have now added a NEW Range of Themed Birthday Packs to the Danilo.com website. If you have a birthday party coming up then these packs are the perfect choice. Depending on the package they can include a Birthday Card, Gift Wrap, Gift Bag, Gift Tags, Birthday Party Invitations and Thank You Cards. Buy everything you need in one go AND by buying the pack you are saving a Whopping 20%!! Don’t forget we also offer FREE UK Delivery! Plus you can choose whether you would like to buy the standard birthday pack or supersize it with the Bumper pack. These are the perfect packs for anyone having a themed birthday! Starting from only £5.50, why not make things easier and purchase all you need in one go with these great new birthday packs! We hope you have some lovely plans for this weekend? 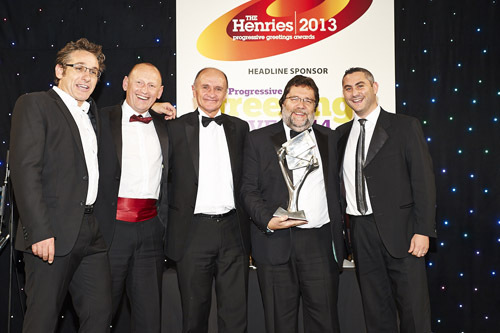 The Danilo team will still be recovering from a late night at the Henries Awards yesterday – and what a fantastic night it was! Themed in the style of Calypso Carnival, over 1000 people were in attendance at the swanky Lancaster London Hotel to celebrate the best in the UK Greeting’s Card Industry. With entertainment provided by Canadian comedian Tom Stade and a fabulous live band; publishers; retailers, artists, distributors and suppliers alike came together to have the best evening. The Danilo Team were extremely pleased to win ‘Best Licensed Card Range award’ for our Laser Cut Greeting Cards. These are designed to beautifully laser the card cover with an iconic image so that when the card is closed, the contrasting colour of the inside pages shows through the cut out design. The range includes Family Guy’ Stewie, Star Wars Yoda, Stormtrooper and Darth Maul as well as Spongebob, Hello Kitty, Top Gear and Wallace and Gromit and are from only £2.25 each! As we had such a great time, we have already put next year’s awards in our 2014 calendar!